The Bordeaux Six Piece Storage Bed Set has the gentle curves of the traditional that mix beautifully with the strength and purpose of mission style. Lower base edges are curved in gentle half moon crescents. Dresser, chest and nightstand are full-bodied and impressive. The headboard features gorgeous panels. The drawers of the storage bed are a dream to use. Rich with solid wood, the Bordeaux style bedroom is one to run to. Choose Wood and Stain and the Building Begins! The selection of solid wood helps define the look you're after. With different grain patterns and finish displays, we have several wood types to match the decor of any bedroom. Finish colors also contribute a great deal, defining the pattern of the wood grain and bringing out its richness. The Bordeaux Six Piece Storage Bed Set is built at the MillCraft woodshop in Millersburg, Ohio. Each piece of wood is carefully selected. Cutting, gluing, sanding and finishing is steady throughout the shop. An entire area of the shop is devoted to building drawer boxes. Every drawer must be the best. Every part of the furniture is inspected and refined. Take a walk through yourself in this video that tours the shop. Ready to Own a Bedroom Set Like No Other? New furniture is exciting and our team is happy to assist you along the way. Select options easily online and speak with a Furniture Specialist if you wish. We are happy to answer all your questions from wood selection to staining to shipping. We thank you for shopping with us. Enjoy Amish furniture that will be passed on for generations. 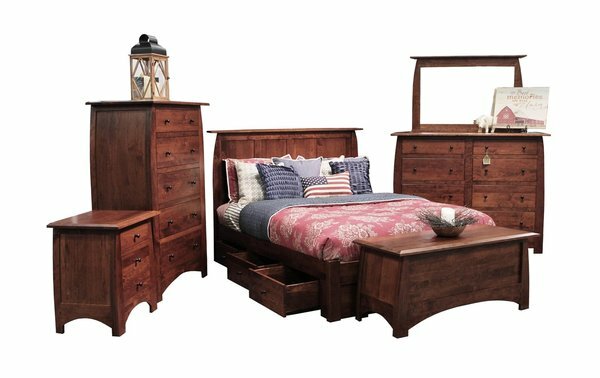 Please Call One Of Our Experienced Amish Furniture Specialists Today - Toll-Free: 1 (866) 272-6773 to make any changes to this bedroom suite.